Chapter “High Hydrostatic Pressure Food Processing: Potential and Limitations” written by Dr. Carole Tonello, Director of Commercial and Applications Department at Hiperbaric, beside Professor Stephanie Jung, from Department of Food Science and Nutrition of California Polytechnic State University (CalPoly), describes High Pressure Processing technology (HPP). It is presented as an alternative to thermal processes widely accepted in the food industry thanks to its interesting strengths: safety, shelf-life enlargement, absence of chemical additives and preservation of nutritional and sensorial properties of food. From Hiperbaric, we invite everybody to discover all the hidden secrets of HPP in the book “Alternatives to conventional food processing”. Hiperbaric, HPP leader enterprise, takes part in the scientific dissemination of this technology working next to researchers and informing costumers about all its advantages and disadvantages. 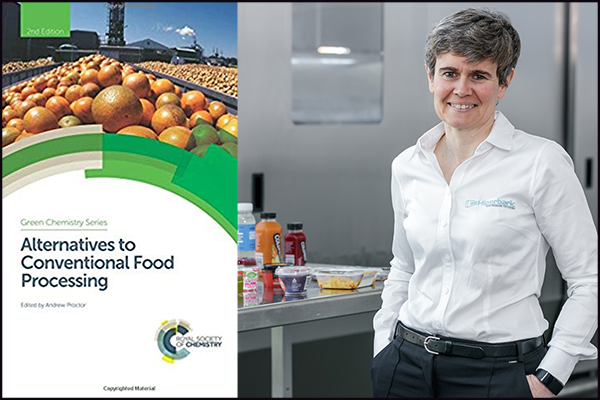 This time, Dr. Carole Tonello, Director of Commercial and Applications Department at Hiperbaric, beside Professor Stephanie Jung, from Department of Food Science and Nutrition of California Polytechnic State University (CalPoly), writes and publishes this 2018 the chapter “High Hydrostatic Pressure Food Processing: Potential and Limitations” in the book “Alternatives to Conventional Food Processing” (Green Chemistry Series, Editor: Andrew Proctor), that, as the title reveals, describes the use of new technologies in food industry, including, for sure, high pressure processing. The chapter at issue describes high pressure processing technology, presenting not only its strengths (clean technology, food safety, shelf-life extension, preservation of nutritional and sensorial properties) but also explaining the parameters related to design and machine operations, the effect of pressure on the different types of food and the commercial applications, among other topics. Specialists, Pr. Jung y Dra. Tonello, affirm that the main interest of HPP lies in the improvement of food safety and shelf-life extension without the need of chemical additives or thermal treatments. This is reached applying high hydrostatic pressure (transmitted by water) up to 600 MPa/ 87.000 psi for a holding time of seconds to minutes. In other words, pressure levels that equals six times the magnitude in the bottom of Marianas’ trench. The greatest advantage of this HPP technology is that results a “cold pasteurization”, meaning that, working in ambience temperature conditions, it is possible to inactivate pathogens and food-borne detrimental bacteria, minimizing the risk of food poisoning as the worldwide dreaded Staphylococcus aureus, Salmonella, Listeria monocytogenes, Vibrio, etc. The book details that HPP not only extends shelf-life of products, but also preserve nutritional properties. Studies mentioned in the chapter prove the stability to HPP of bioactive compounds, micro and macronutrients such as vitamin C, phenolic compounds, isoflavones, minerals, fructooligosaccharides, etc., while the toxic compounds derived from thermal treatments (e.g. acrylamide, furans) are avoided. HPP can also influence in the rheology, texture and sensorial characteristics of the product; this fact can be positive or not depending on the desired final product. For instance the beef meat present textural changes, the hardness is reduced due to modifications in the cathepsin-calpain enzymatic system; fish proteins is restructured forming gels (desirable in surimi based products); milk pretreatment by HPP enhances ripening and draining of cheese and yogurt firmness, due to the better formation of casein gels. Other ingredients such as soy or egg protein used as emulsifiers, increase significantly the stability of the foam after HPP treatment. Effect on color can also goes from no changes (this is the case of jams, juices, fruit purees, sauces and cooked meats) to considerable changes such as the blanching of fish muscle or yellowing of milk. Flavor modifications may also occur slightly, but they are subjected to the formulation and composition of food. The book displays other application of high pressure processing different from the microorganisms inactivation, the peeling of shellfish without heat. The pressures compress and modify the protein structure that links the meat to the shell of crustaceans and mollusks (such as lobsters, crabs, oysters, clams…), separating immediately after the HPP process. This application reduces both the labor cost of peeling and the time spent, increasing considerably the production yield of shellfish companies. In terms of commercial applications, any food that has water activity (Aw) over 0.8 and that stays sealed in its flexible packaging, can be processed by HPP to achieve the logarithmic reduction required by technical-sanitary regulations, doubling or tripling its shelf-life: dips and sauces (specially guacamole), meat products, juices and beverages, seafood, dairy products and ready-to-eat meals (RTE). This is why nowadays, HPP machines are used in many food sectors, as shown in Figure 2. Figure 2. 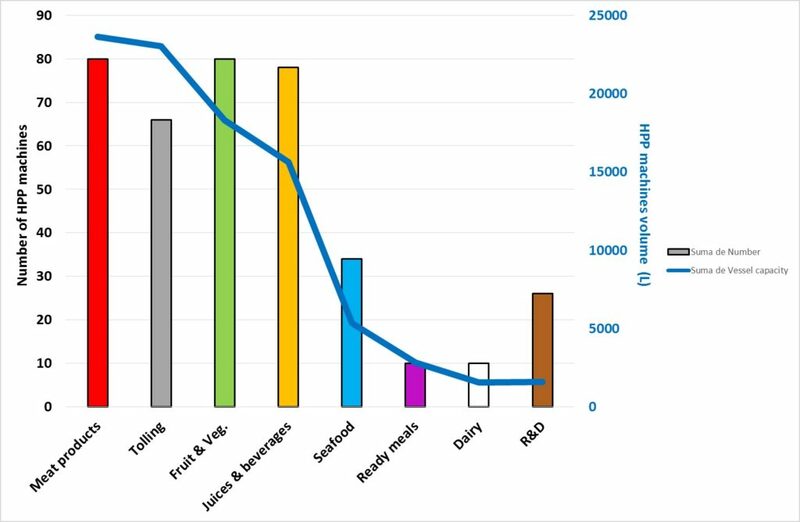 Industrial level distribution of HPP machines (number and production volume) for each food sector in the end of 2016. Due to the relevance of this technology in all food sectors, the chapter has a detailed list of all the companies that make use of it, the geographic distribution and the incidence of the machines in the five continents, and news about fairs and specific events on HPP celebrated worldwide. The article cannot conclude without giving thorough knowledge all technical aspects of the design, operations, production yield, investment and costs of the machines. In a summarized way, the product is introduced in a cylindrical vessel of 20-38 cm in diameter, where the water is introduced to reach 6000 bar of pressure. The vessels, with capacities of up to 525 liters, allow to process more than 3000 kg of product per hour, with a cost of 0.064 € per kg processed in the largest model. The HPP process is considered a clean technology, which contributes to the trending topic of “green chemistry”, it entails the use of industrial technology that respects the environment. The machines only require electricity and water, the latter will be recycled by 85%. In addition, it allows reducing or removing chemical additives from food, and does not generate molecules derived from the process that did not exist in the initial product. If you want to know more about HPP technology, do not hesitate in reading the chapter “High Hydrostatic Pressure Food Processing: Potential and Limitations” from the book “Alternatives to Conventional Food Processing”, let yourself discover all aspects related to high pressure processing (history, technological interest, food safety, shelf-life extension, nutritional, functional and organoleptic effect, food applications, world market situation and technical data on industrial equipment). You can also contact Hiperbaric and we will personally attend to your concerns.